Draft: 2012, Kansas City Royals, 1st rd. Full name is Kyle Joseph Zimmer...resides in La Jolla, Calif...Graduated from La Jolla (Calif.) High School in 2009...Attended the University of San Francisco, where he moved from third base to the mound as a freshman… led pitching staff with 89 strikeouts in 2011..A two-time first-team All-West Coast Conference honoree and was selected a preseason second-team AllAmerican by Baseball America and to the Midseason USA Baseball Golden Spikes Award Watch List...Pursued a business degree at USF, where he was named to the 2012 WCC All-Academic team...Father, Eric, played baseball at UC-San Diego, while his mother, Cathy, ran track at San Diego State… younger brother, Bradley, was a first-round pick in 2014 and is an outfielder with the Cleveland Indians. Designated for assignment on March 29, but signed a minor league contract on April 6 to remain in the Royals' organization...Did not pitch in 2018…spent six months at Driveline Baseball facility in Seattle, Wash. on a data-driven strength training program. Spent majority of the season with Omaha (AAA), after opening the year at Northwest Arkansas (AA)…combined to make 21 appearances and three starts, posting a 5.40 ERA (22 ER in 36.1 IP) with three saves in three chances ... Missed nearly two months of action, being placed on the disabled list on April 24 with a right shoulder injury… reinstated on June 13…worked exclusively out of the bullpen following the DL stint ... Over his final eight outings, posted a 2.61 ERA (3 ER in 10.1 IP) with five walks and 12 strikeouts in that span (July 19 to end of season) ... Made one start for the Naturals, allowing one run on six hits over 4.0 innings, taking a no-decision in a 5-3 loss to San Antonio ... Entered the season rated as the No. 10 prospect in the Royals' organization, according to Baseball America. Injuries limited him to three starts, pitching at Northwest Arkansas (AA) and Wilmington (A)...Surrendered just one earned run in 5.2 innings, but suffered a pair of losses...Recorded five strikeouts in 1.2 innings in his season debut on May 7 vs. Myrtle Beach...Diagnosed with thoracic outlet syndrome in May and missed the final three months of the season, following surgery...Rated as the No. 10 prospect in the Royals' organization by Baseball America following the season. Kyle split the season between Lexington (A) and Northwest Arkansas (AA) posting 2.35 combined ERA (17 ER in 64.0 IP) in 24 appearances (seven starts) between the two stops...Returned to the mound from offseason shoulder surgery on May 29, tossing 1.2 scoreless innings for Lexington vs. Greenville...earned his first victory of the season in his next outing, June 2, with 2.0 shutout frames vs. Rome...Promoted to Northwest Arkansas July 2...went 1-0 with a 1.65 ERA (3 ER in 16.1 IP) as a reliever and was 1-4 with a 3.41 ERA (12 ER in 31.2 IP) in his seven starts...Held left-handed hitters to a .217 average (18-for-83), while righties batted .250 against him (24-for-96). Rated as the top prospect in the Royals' organization by Baseball America prior to the 2014 season.....tabbed the Royals' prospect with the "Best Curveball" and "Best Control" entering 2013 and "Best Curveball" and "Best Slider" in 2014. Kyle spent a majority of his second professional season with Wilmington (A-Advanced), but was promoted to Double-A Northwest Arkansas on July 14..Ranked seventh in the Carolina League with 113 strikeouts...needed just 89.2 innings to reach his total, while the six pitchers ahead of him all threw over 100.0 innings in the league...Recorded his second professional shutout on June 29, blanking Potomac on two hits in a 7.0-inning complete game...Posted a 2-1 mark with a 1.93 ERA (4 ER in 18.2 IP) in his first four starts with the Naturals, before being shut down for the season on August 16 with right shoulder tightness. Posted a 2-1 record with an 0.38 ERA (1 ER in 23.2 IP) in August with Kane County..recorded a season-best 7.0 innings on August 16, 2012 vs. Clinton, in a 5-3 triumph. 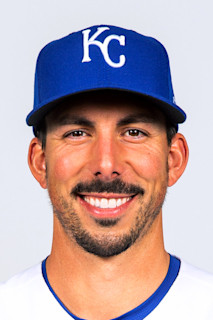 April 8, 2019 Kansas City Royals optioned RHP Kyle Zimmer to Omaha Storm Chasers. January 4, 2019 Kansas City Royals signed free agent RHP Kyle Zimmer. November 2, 2018 RHP Kyle Zimmer elected free agency. September 27, 2018 Omaha Storm Chasers activated RHP Kyle Zimmer from the 7-day disabled list. June 20, 2018 RHP Kyle Zimmer assigned to Omaha Storm Chasers from AZL Royals. April 7, 2018 RHP Kyle Zimmer assigned to AZL Royals. April 6, 2018 Kansas City Royals signed free agent RHP Kyle Zimmer to a minor league contract. April 3, 2018 Kansas City Royals released RHP Kyle Zimmer. March 29, 2018 Kansas City Royals designated RHP Kyle Zimmer for assignment. March 13, 2018 Kansas City Royals optioned RHP Kyle Zimmer to Omaha Storm Chasers. October 2, 2017 Kansas City Royals recalled Kyle Zimmer from Omaha Storm Chasers. June 13, 2017 Omaha Storm Chasers activated RHP Kyle Zimmer from the 7-day disabled list. April 24, 2017 Omaha Storm Chasers placed RHP Kyle Zimmer on the 7-day disabled list retroactive to April 21, 2017. April 11, 2017 RHP Kyle Zimmer assigned to Omaha Storm Chasers from Northwest Arkansas Naturals. March 8, 2017 Kansas City Royals optioned RHP Kyle Zimmer to Northwest Arkansas Naturals. October 3, 2016 Kansas City Royals recalled Kyle Zimmer from Northwest Arkansas Naturals. September 30, 2016 Northwest Arkansas Naturals activated RHP Kyle Zimmer from the 7-day disabled list. June 2, 2016 Northwest Arkansas Naturals placed RHP Kyle Zimmer on the 7-day disabled list. May 17, 2016 RHP Kyle Zimmer assigned to Northwest Arkansas Naturals from Wilmington Blue Rocks. May 7, 2016 RHP Kyle Zimmer assigned to Wilmington Blue Rocks from Omaha Storm Chasers. April 5, 2016 RHP Kyle Zimmer assigned to Northwest Arkansas Naturals from Omaha Storm Chasers. March 14, 2016 Kansas City Royals optioned RHP Kyle Zimmer to Omaha Storm Chasers. November 20, 2015 Kansas City Royals selected the contract of Kyle Zimmer from Northwest Arkansas Naturals. September 9, 2015 Northwest Arkansas Naturals placed RHP Kyle Zimmer on the temporarily inactive list. July 2, 2015 RHP Kyle Zimmer assigned to Northwest Arkansas Naturals from Lexington Legends. April 5, 2015 RHP Kyle Zimmer assigned to Northwest Arkansas Naturals from Omaha Storm Chasers. October 20, 2014 Peoria Javelinas reassigned RHP Kyle Zimmer to the minor leagues. September 17, 2014 RHP Kyle Zimmer assigned to Peoria Javelinas. September 5, 2014 RHP Kyle Zimmer assigned to Omaha Storm Chasers from Northwest Arkansas Naturals. September 3, 2014 Kyle Zimmer assigned to Omaha Storm Chasers from Idaho Falls Chukars. August 17, 2014 Northwest Arkansas Naturals sent RHP Kyle Zimmer on a rehab assignment to Idaho Falls Chukars. January 9, 2014 Kansas City Royals invited non-roster RHP Kyle Zimmer to spring training. September 6, 2013 Northwest Arkansas Naturals activated RHP Kyle Zimmer from the temporarily inactive list. August 21, 2013 Northwest Arkansas Naturals placed RHP Kyle Zimmer on the temporarily inactive list. July 20, 2013 Northwest Arkansas Naturals activated RHP Kyle Zimmer. July 19, 2013 RHP Kyle Zimmer assigned to Northwest Arkansas Naturals from Wilmington Blue Rocks. March 29, 2013 Kyle Zimmer assigned to Wilmington Blue Rocks from Lexington Legends. September 27, 2012 Kyle Zimmer roster status changed by Lexington Legends. August 27, 2012 Kane County Cougars placed RHP Kyle Zimmer on the 7-day disabled list. July 24, 2012 RHP Kyle Zimmer assigned to Kane County Cougars from AZL Royals. June 13, 2012 Kyle Zimmer assigned to AZL Royals. June 7, 2012 Kansas City Royals signed RHP Kyle Zimmer.